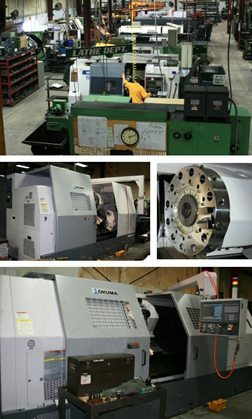 In our Lathe Department, we house 17 late model CNC lathes. These machines are ready to produce chips on all shifts with full inspection of parts. Five new CNC lathes were added recently to the lathe department. Three of these are fully equipped with live milling capabilities: the Okuma L470BBM/650, the Okuma LU400BBM/1250 with a 15” chuck and twin turrets, and the Okuma LB45IIMBB/1000 equipped with a 24” chuck. These precise machines allow us to provide a wide range of services. In addition to traditional CNC lathe capabilities, the machines also produce off-center radial and face cut features minimizing programming time and maximizing production efficiency. Also joining the family of lathes is the Okuma LB45IIMBB/750 equipped with a 24” chuck, and the long-bed Okuma LB35IIBB/2000. These machines were created accommodate massive material with precision.